I recently had to create a Windows 7 bootable USB flash drive for my girlfriend because she doesn't have a DVD-ROM, and I had to do it from Ubuntu as I don't have Windows (neither at work or at home). 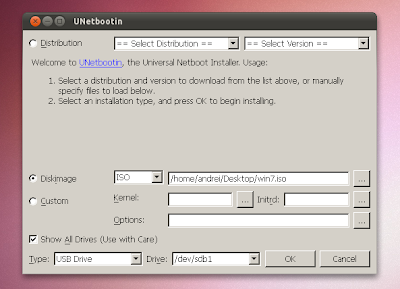 What I ended up on using is the good old (just a figure of speech) UNetbootin which is available for both Windows and Linux. 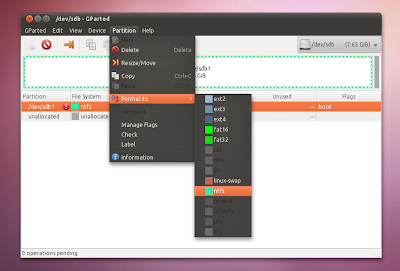 It's in the Ubuntu repositories so to install it, search for it in the Ubuntu Software Center. For Windows and other Linux distributions, get it from HERE. Firstly, make sure you have a Windows 7 .ISO file (you can create it from the DVD) and a 4GB USB flash drive (or larger). To format the USB drive as NTFS, open Gparted via the System > Administration > GParted Partition Editor. Then select your USB drive from the top right drop-down. If you only have one hard disk, your USB drive should be "sdb". Now right click your USB drive in GParted and select "Unmount" and you'll then be able to select Partition > Format > ntfs. The drive will be formatted to NTFS in a few seconds. I'm not sure if UNetbootin will mark the drive as bootable as my USB drive already had the "boot" flag enabled from Gparted, so you may want to enable it too: right click the USB drive and select "Manage flags", then check the "boot" flag. Then you'll have to mount the USB drive back. You can do it from the command line or Disk Utility (System > Administration > Disk Utility) but to keep things simple, you can just unplug the USB flash drive and plug it back in to the computer. 2. Some users have reported that some recent Unetbootin versions no longer let you select an USB drive formatted to NTFS and by formatting it to FAT, the Windows 7 installation fails. So here's what to do: download Unetbootin version 494 from HERE (version tested and it should work). Then, right click the downloaded Unetbootin file, select Properties and on the "Permissions" tab, check the "Allow executing file as program" box. Then simply double click it and it should open. Using this (494) Unetbootin version, you have an option to "Show all Drives" which lets you select the NTFS formatted drive and write the Windows 7 ISO onto it. With newer version, this option is no longer available. 3. Open UNetbootin, select "Diskimage" and then browse for your Windows 7 ISO file. Now simply click the "OK" button and wait for the files to be copied to the USB drive. 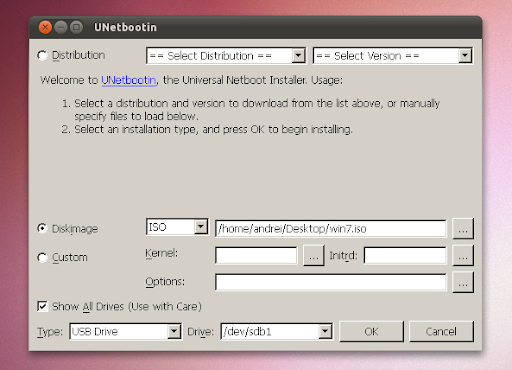 After Unetbootin is done, you can use the USB stick to install Windows 7 on any computer that supports booting from an USB drive.